Several of the 16 sheriffs who received a letter from the governor directing them to honor ICE detentions say they won't do so because it violates the U.S. Constitution. Gov. Paul LePage put two Maine sheriffs on notice Tuesday after they said they would not hold suspects for federal immigration officials without warrants, issuing a letter that directed all sheriffs in the state to cooperate fully with Immigration and Customs enforcement or face removal from office. In a letter sent to all 16 counties, LePage invoked his statutory authority to direct sheriffs in law enforcement matters, and pointed to a 2011 executive order directing all employees and officials of the State of Maine to cooperate with federal immigration officials, except when limited by the law or the state and U.S. constitutions. But one of the sheriffs, Cumberland County’s Kevin Joyce, said he was unswayed by the governor’s letter. Joyce also said he doubted that LePage grasps the nuances of the ICE detention process, and questioned whether the governor’s order is lawful. While LePage’s order directs compliance with ICE, it also acknowledges that his directive can be limited by statute or the constitutions of Maine or the United States. Several sheriffs echoed Joyce’s concerns. On Tuesday, Oxford County Sheriff Wayne Gallant said he would not retain anyone if he believed it violated their constitutional rights. “Right now, most of us believe that it’s up to each individual sheriff on what decision they should take,” he said. LePage’s letter came a day after the Republican governor told national radio host Laura Ingraham that he would remove from office any sheriff who does not cooperate. Joyce and King apparently triggered the governor’s action when they said last week that they no longer would honor detention requests because they would leave their counties open to legal liability. ICE detainers are an administrative request for a local agency, such as a sheriff, to hold someone for up to 48 hours who otherwise could be released from jail. The request is designed to give ICE agents time to investigate whether someone should be subject to deportation. Federal judges, however, have ruled that holding a person simply at the request of another agency without probable cause is a violation of the Fourth Amendment right against unreasonable seizures. The disagreement stems from the difference in legal authority on which each law enforcement group operates. Federal immigration law is mostly civil, while county jails are set up to hold people on criminal charges. The letter also was lauded by state Republicans, who framed the issue around public safety. Joyce has said he would continue to honor detainers if they are accompanied by a judicial warrant, or if ICE inmates are booked into the facility directly from ICE custody. There are currently seven ICE prisoners at Cumberland County Jail, Joyce said. The Maine Attorney General’s office did not return multiple calls Monday and Tuesday seeking clarification on the legal aspects of the dispute, and the procedures for a governor to remove a sheriff. But Zachary Heiden, the legal director at the American Civil Liberties Union of Maine, said it appears the governor’s office is misinterpreting a key court decision, Morales v. Chadbourne, that the governor cited in a public statement. The ruling in the 2015 case states that ICE must have probable cause before issuing a detainer, but the LePage administration mistakenly believes the ruling says that ICE is only issuing detainers when it has probable cause, Heiden said. The Maine Constitution gives LePage the power to remove a sheriff who “is not faithfully or efficiently performing any duty imposed upon the sheriff by law.” The procedure, last attempted in 1951, requires a complaint, due notice to the sheriff and a hearing. LePage said he would pursue removal if any citizen notifies him of a written ICE detainer that had been ignored by a sheriff’s office. LePage spokeswoman Julie Rabinowitz said the governor’s office was reviewing case law to determine how the process had been used in the past. “However, the goal is to have the sheriffs comply, and then there will never be a need to investigate complaints or initiate a removal process,” Rabinowitz said in an email. A growing number of federal judges have found that ICE detainer requests do not themselves constitute probable cause, meaning jails that honor them are at risk of being sued for civil rights violations. King did not respond to requests for comment left with his office Tuesday. The letter from the governor appeared after a Sept. 14 decision by Joyce to no longer honor those detainer requests. King, in York County, also said he would not honor a detainer if presented with one, but that discussion is hypothetical so far; King said his jail had not received a single detainer request in the two years since he was elected. Cumberland County, meanwhile, has seen an uptick in ICE-related detentions at the jail, including a jump in the number of detainer requests. In Kennebec County, Sheriff Ken Mason said he will not honor detainer requests without a warrant or other document signed by a judge. The point has been largely moot – Kennebec County jail does not hold federal prisoners because it has been chronically overcrowded, so ICE inmates cannot be housed there. Somerset County Sheriff Dale Lancaster said his office would honor a detainer if he receives one, but the county has not housed an ICE detainee yet in 2017, and Lancaster could not remember any detentions in recent years. Androscoggin County received two requests from ICE in the past year to detain inmates, but both were being held on criminal charges, Sheriff Eric G. Samson said. 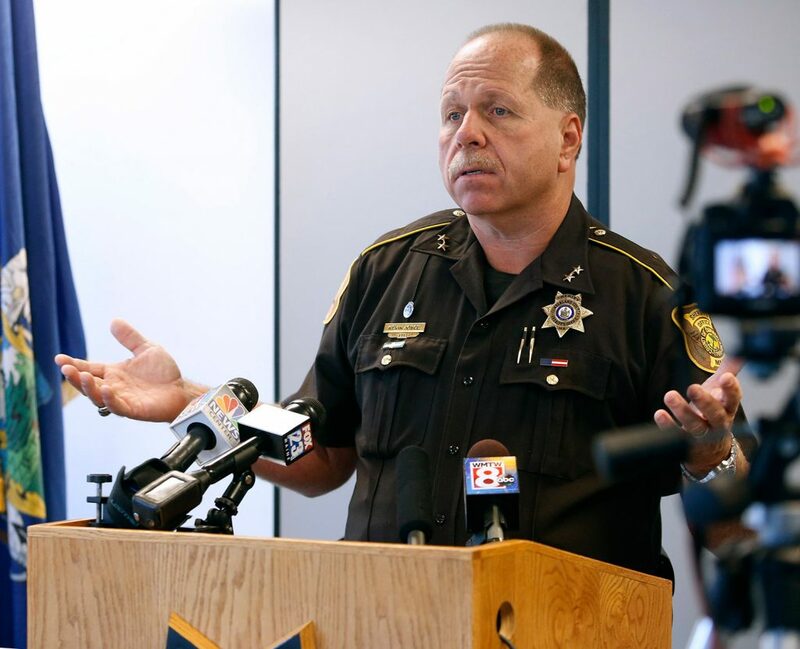 Gallant, the Oxford County sheriff, said he will make his decisions on ICE detainers based on the law. Kennebec Journal Staff Writer Jessica Lowell, Morning Sentinel Staff EWriter Colin Ellis and the Lewiston Sun Journal contributed to this report.